March 27, 2014 Nefer Khepri, Ph. D.
The Doppelganger – Do You Have One Roaming Around Somewhere? Have you all heard the old wive’s tale that each of us has a doppelganger somewhere in the world? This is another person who looks just like you. That is not the original definition, however. The original definition states that the doppelganger was a ghostly reflection of a living person. Thought to be a form of bilocation with a sinister intention, it was believed to be very bad luck should someone report to you they have seen your doppelganger. Sometimes it was viewed as a harbinger of death. Have any of you had any experience with your doppelganger? 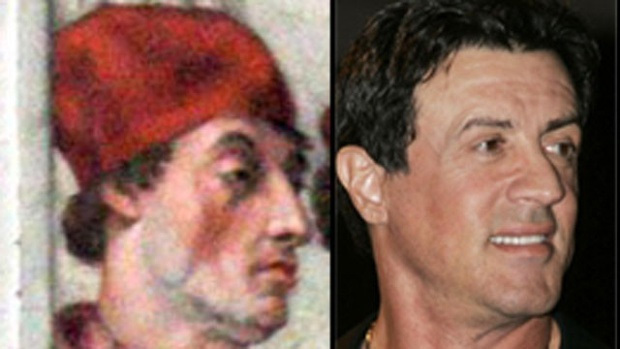 A medieval fresco painting by the great artist Raphael on a wall at the Vatican shows a man who looks remarkably like actor Sylvester Stallone. I saw the fresco in person in 2012 & was stunned. Vatican guides enjoy pointing this out to people. He kept laughing, thought I was joking so I whipped out my student ID. Then he was so confused. He looked me up & down and said, “No. YOU’RE Liz!” I said, “sorry, I have no idea who this Liz person is!” I then showed him the interior of my backpack & said, “does this stuff look like it belongs to a Chem student?” He looked, saw a couple of Anthropology books & an archaeology book in there & said, “Wow, no, it doesn’t!” He finally believed me & began telling me about her. She’s very smart, a very nice person, kind of shy – it sounded like he was describing ME, but she wasn’t me! This went on all 4 years I was at UT. I never did run into this mysterious Elizabeth I’d hear so much about nearly every time I headed up to North Campus. The funny thing is this – Elizabeth is my favorite name for a woman. Had I had my way, my daughter would have been named Elizabeth! Previous MERCURY RETROGRADE August 30 – September 22, 2016: How to get through it.